In its first major announcement since the acquisition by AMD, SeaMicro unveiled its SM15000 server. This is an updated version of the standard 10U SeaMicro chassis with 64 compute card slots. 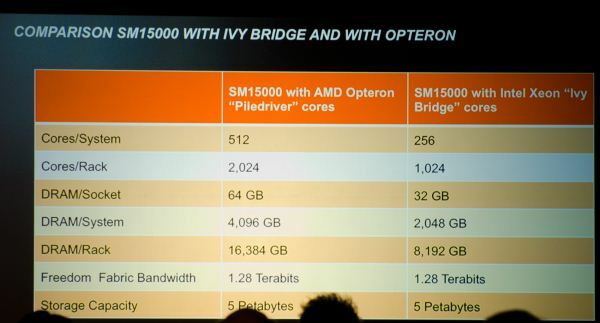 The new SM15K can accept both Intel Ivy Bridge and AMD Piledriver based processor cards. Despite being AMD owned, SeaMicro is committed for generations to come to supplying both Intel and AMD based servers. Seamicro still supports Intel based clusters to make sure that they do not alienate some of their customers. In virtualized environments, moving around VMs only works well if you standarize on Intel or AMD. So Seamicro will still build Intel based clusters for next years. SeaMicro is particularly proud of the fact that its processor network fabric can support other CPUs outside of AMD/Intel as well. Despite the flexibility SeaMicro believes that ARM's Cortex A9 isn't very interesting, but in late 2013/early 2014 ARM could have a part out that's compelling. According to SeaMicro, 6 racks of classic servers and storage which would consume 40 kW can be replaced with 2 racks containing SeaMicro SM15000s, which consume only 20 kW at half the price. In 10U, you get 64 sockets, each with a new octal Piledriver Opterons at 2.8 GHz (or 2/2.3 GHz). That is 512 Cores in 10 RU, 64 GB per scoket, 4 TB per system. With the Xeon, the fastest CPU is a quadcore 3.1 GHz (256 cores per system) supporting 32 GB of ram per socket, 2 TB per system. SeaMicro has extended its Freedom Fabric to now work outside of the chassis as well. Using external storage expansion you can get up to 1408 disks (HDD/SSD) or up to 5PB of storage connected to a single server. That's something I'd like to see as well, and it would have a place. Remember, what you're talking about in a server situation is many times a 'headless' system (ie: no monitor/keyboard/mouse) so there's no need for a graphical interface (command line only). As such, there's plenty of die space (the iGPU) just sitting idly by instead of being utilized - and it's all still fitting in the 15-30w TDP. You need to consider performance AND low power in efficiency. GPUs are very useful in compute servers. There are entire supercomputers built with GPUs (http://www.bit-tech.net/news/hardware/2010/10/28/n... so if you are going to use software appropriately written to be accelerated by GPU, the Trinity's version of this "cluster" is going to kick Ivy Bridge where it hurts.